Summer is HERE! 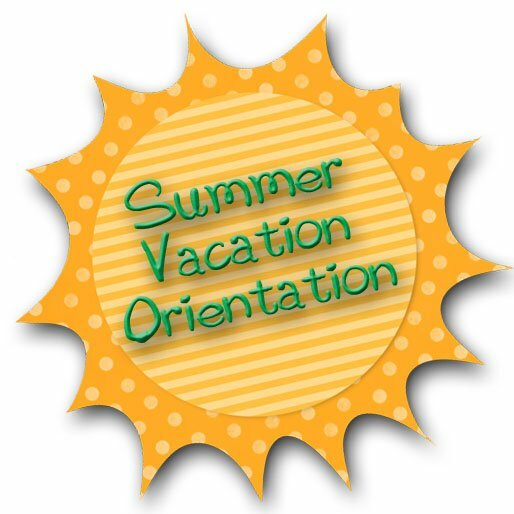 We’re a little late getting our Summer Vacation Orientation rolled out this year. The school year ended and everyone was exhausted. Then we had our trip to Cedar Point. We’re just getting to our orientation now. We wanted to change things up a little bit this year. As the kids get older we’re finding that their individual needs are so different so a cookie cutter approach just wasn’t going to work. My little “E” – he’s 3 and very good at it. If he doesn’t get enough outdoor exercise, we will all suffer. I mean SUFFER! This kid needs to run out all the energy he can during a day. If not, there will be fights, screaming, accidents – just plain misery for everyone around. Our focus with him will be keeping him busy. 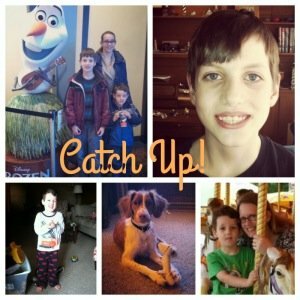 He’s almost done with potty training – yay! There are a few accidents here and there so we need to work on that too. And -sigh- we need to work with him on some simple responsibilities. He needs to learn that if he takes toys out, he’s responsible for putting those toys away. “G” – he’ll be 10 in 3 short weeks. As you may have read earlier this week, he needs to work on his reading skills this summer. It will be challenging because he will fight and we’ll need to always be “game on” with him. His BIG motivator is electronics (TV, computer time, Kindle (for games) time, etc.). Much to his dismay we have decided to tie in reading time with electronic time. If he wants to play games on the computer, he has to read first. Each minute reading will earn him a minute of electronic time. “A” – whew – we officially have a teenager in the house. There’s the huffs and the eye-rolls and the typical parents don’t exist thing going on. She’s going to be a high schooler next year. I’m SO not ready for that. As her world is expanding, she’s wanting to get out with friends more often. That’s okay and we’re happy that she has a good group of friends. She’ll be challenged with keeping up with her responsibilities at home. Mom and Dad might be wanting a date night or two, so some babysitting will be on her list this summer. She’s gotta earn money for that social life, right? Without further ado, it’s time to reveal this year’s handouts. Yes, we have a family meeting and pass out these sheets and explain to everyone what our expectations are and how they can earn fun things. We still have chore day. The kids voted on Wednesday as the day. 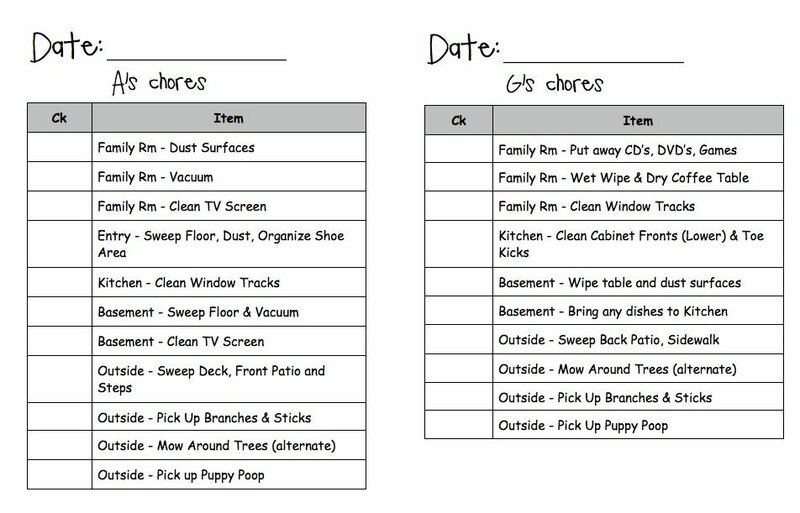 Here’s the breakdown of chores. Money is a little tight around here so we can’t afford to pay their age as their wage, instead we are paying $5. We had started a “chore” day on Saturday mornings during the school year and it has finally become part of our routine. So, we’re keeping it too. These chores are done without pay as part of being a responsible family member. Just 4 things: change sheets, clean room, clean bathroom, and pickup family room in basement. Besides the bathroom cleaning, the chores can be easily finished if they keep things clean during the week. We decided not to assign an activity to each day this year. Our schedules are already booked like crazy. “A” has tons of stuff going on with Color Guard. “G” is going to VBS at church and is doing a Tech Club. “E”? Well, don’t worry about him. We’ve got weekly play dates and I signed him up for a VBS too. How do you manage summer? Want to check out our previous years Summer Vacation Orientation posts?